College Heights Herald – newspaper Pacemaker finalist. WKUHerald.com – online Pacemaker finalist. WKUTalisman.com – online Pacemaker finalist. 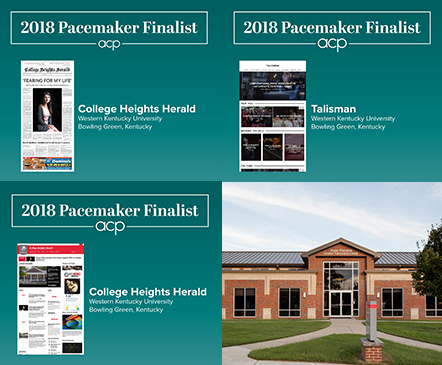 The Pacemakers, awarded by the Associated Collegiate Press, are judged on the overall quality of the publications – everything from reporting and writing to visual journalism and design. In addition, 16 students on the staffs of the Herald and Talisman are finalists for ACP national individual awards in nine categories. The contests cover work published during the 2017-18 academic year. Andrew Henderson, a May 2018 graduate from Olive Hill, was editor-in-chief of the Herald, and Helen Gibson, a May 2018 graduate from Cadiz, was editor-in-chief of Talisman for 2017-18. WKU Student Publications is one of only five programs in the country to have three Pacemaker finalists in 2018. Other programs with three finalists are Kent State University (one online and two magazine finalists), the University of Miami (newspaper, magazine and yearbook finalists), Michigan State University (newspaper, online and yearbook finalists) and Syracuse University (newspaper, magazine and online finalists). Winners of the 2018 Pacemaker Awards will be announced Oct. 27 at the National College Media Convention in Louisville. In 2017, WKU Student Publications brought home three Pacemaker Awards for WKU – a newspaper Pacemaker for the College Heights Herald, an online Pacemaker for WKUTalisman.com and a yearbook Pacemaker for the 2016 Talisman, its final edition as a yearbook. Over the years, WKU Student Publications has collected 36 national Pacemaker Awards – 20 for Talisman and 16 for the Herald. Both publications are in the ACP Hall of Fame. Reporter of the Year: Hannah Good, Talisman, for “It happens here: Honors freshman tells her story of sexual assault,” “WKU introduces LGBT-friendly dorms,” and “Behind the scenes with drag kings and queens.” Good is a senior from Alexandria and the current editor-in-chief of Talisman. News Story of they Year: ‘Fearing for my life,” Andrew Henderson and Nicole Ziege, College Heights Herald. Henderson is a May 2018 graduate from Olive Hill and Ziege is a senior from Morning View. Feature Story of the Year: “Reaching redemption,” Phi Chu, Talisman. Chu is a junior from Bowling Green. Sports Story of the Year: “For Life,” Evan Heichelbech, College Heights Herald. Heichelbech is a senior from Louisville and the current editor-in-chief of the Herald. Sports Story of the Year: “Game, set, unmatched” Hayley Robb, Talisman. Robb is a junior from Georgetown. Sports Photo of the Year: “Tug,” Chloe Cooper, Talisman. Cooper is a sophomore from Louisville. Multimedia Sports Story of the Year: “Backwards and on roller skates,” Chloe Cooper, Lillie Eastham and Chris Kohley, Talisman. Eastham is a junior from Somerset and Kohley is a sophomore from Naperville, Illinois. Multimedia Sports Story of the Year: “Sights and sounds of Fight Night 2018,” Michelle Hanks, Hannah LeBoeuf and Grace Pritchett, Talisman. Hanks is a senior from Chattanooga, Tennessee; LeBoeuf is a junior from Louisville and Pritchett is a senior from Evansville, Indiana. Photo Slideshow of the Year: “Faces of BG Pride,” Lydia Schweickart, Talisman. Schweickart is a junior from Louisville. Magazine Spread of the Year: “Reaching redemption,” Emily Johns, Talisman. Johns is a May 2018 graduate from Bowling Green. Illustration of the Year: “Side of fees,” Brook Joyner and Nic Huey, College Heights Herald. Joyner is a May 2018 graduate from Chattanooga, Tennessee, and Huey is a junior from Atlanta, Georgia.